First Line: Oh, no, no, no, thought Clara Morrow as she walked toward the closed doors. The raid on the factory that occurred in Bury Your Dead has had lasting effects on Inspector Armand Gamache and his team of the Sûreté du Québec's homicide division. Just what those effects are we're able to see when the team is assembled in the small village of Three Pines. Clara Morrow's dream has finally come true. The famed Musée d'Art Contemporain in Montréal is having an exhibition of her art. Art experts and critics from the local scene and from as far away as New York, Paris and London are at the vernissage, and Clara's party afterwards in Three Pines is a smashing success... for everyone except Lillian Dyson, whose body is found in Clara's flower garden the next morning. When Inspector Gamache and his team converge on the village and begin gathering evidence, one of the first inconsistencies that pops up is about the victim herself. Lillian and Clara were best friends in childhood, but wound up being enemies during the final years of school. Lillian went on to become an art critic known for her skill in ending an artist's career with a cruelly well-written line. However, when her current friends are tracked down and interviewed, they all liked the murder victim and found her kind and helpful. Was it possible for Lillian to have changed so drastically? That's just one of the many questions that have to be answered on route to discovering her killer. 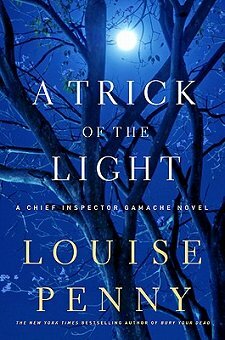 Louise Penny's books are at the top of my "must read" series. Some detractors say that everyone and everything is just a bit too perfect in her books, and that they prefer a bit more reality in their crime fiction. To each his own! I don't find any of the characters "perfect". Perfectly drawn by Louise Penny perhaps, but not as shining examples of the perfect human being. Gamache and his second-in-command Jean Guy Beauvoir are both fighting off the physical and psychological horrors of that factory raid, and their struggles have changed the ways in which they deal with the people around them. As usual, the murder investigation was compelling. At its heart was the character of the murder victim herself. What was Lillian Dyson-- devil or angel? Just how much can a person change over the years? Is it possible for a person to change? Gamache and his team are forced to dig deep into this woman's life in order to find out who was responsible for her death. Three Pines may have the appearance of a picture postcard village, but scuffle those autumn leaves on the ground with the toe of your shoe, and who knows what you'll find? The remains of a dead sparrow. A worm. A gold ring. A discarded snakeskin. Acorns. Three Pines is a microcosm for the world outside. Usually evil arrives in town by traveling the road from the outside, but not always. Occasionally an emotion, an old hurt or hatred, lies just beneath the surface moldering away for a long time, and all you have to do to bring it to life is to scuff those leaves aside. What is different in Louise Penny's take on crime is that her main character believes that if you sift through evil, you'll find good at the very bottom. Like Gamache I, too, like to believe that good can be found at the bottom of that barrel, and I enjoy following the career of a character who believes the search is worthwhile... and worth doing with respect and love. If you like complex plots full of psychological insight and books filled with characters you come to know as well as you know members of your own family, get your hands on Louise Penny's books! Do not delay! I've got to make the time to read one of Penny's books! They sound wonderful. Ooh, I love Louise Penny books and can't wait to read this one. This is one of the few series where I think they need to be read in order. Fantastic review! Kaye-- This series is so good that I can't understand how anyone could pick up one and read it... and not want to read all the rest. But I've read the reviews, and there are a few folks out there who don't care for 'em. I imagine it all evens out, though. I probably don't care for one of their all-time favorites! I have seen wonderful reviews of this one, and was wondering if it could be read out of order? I see the previous commenter's feeling that the series should be read from first to last. I have not read any of her books, so I guess I need to get the first one.